I found this colorful caterpillar one day at the nursery where I work. At first, I was a little grossed out, but upon closer examination, I discovered that it was really quite colorful. 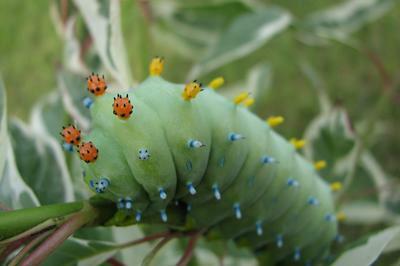 I have never seen a caterpillar this size or this colorful in Manitoba before. I photographed him and then let him go. do you think this type of caterpillar stings? please let me know. My son recently photographed a caterpillar like this on an apple tree in east Tennessee. Wonder what the species is and what kind of butterfly it turns into?